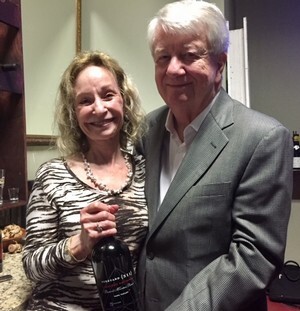 Ed and I were recently in Orlando, Florida, to pour our wine at a wine dinner and at a wine tasting for members of Women for WineSense (WWS), Orlando Chapter. WWS is a nationwide education, mentoring and networking organization for wine aficionados and industry professionals, both women and men. There is a Napa/Sonoma branch, the founding chapter, actually founded 27 years ago by a woman with whom I play tennis at Meadowood, Michaela Rodeno. 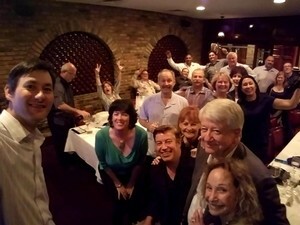 The dinner was held at a steakhouse, Christner's (formerly Del Frisco), where WWS members and other guests, sampled our wine. The juicy steak was a great accompanyment to our 2012 and 2013 Cab. The next night, our wine tasting was held at our distributor's warehouse, where our Chardonnay and Pinot Noir, in addition to our Cab, paired wonderfully with the cheese and charcuterie provided by WWS. We tried to go to Epcot Center on our last day in Orlando, but we got rained out. We'll try again next time in Orlando. And now that I know about WWS and am very impressed with the organization, I will definitely check out the Napa/Sonoma chapter. Ed and I took time off from gazing at grape vines to gazing at the thick swinging vines in the foliage of tropical rain forests. Over the New Year's holidays and then again in February, we found ourselves in Central America among howler monkeys and crocodiles. The first of the two trips was to Costa Rica with our kids Kelly and Jeff and their son--our 5-year-old grandson Ian. 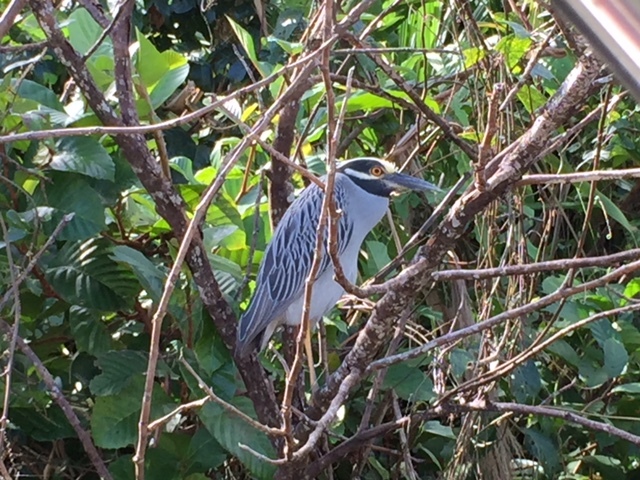 We stayed at a jungle resort called Tortuga Lodge and Gardens, set on a private rain forest reserve bordering Tortuguero National Park on the north Caribbean coast. We flew in from Liberia on a light charter flight and landed on a very short local airstrip. Whew! We then crossed the Tortuguero River by boat to get to the lodge located on the river; the only way to get there is by boat as there are no cars on the island, only flat-bottomed boats. From there, we did some great kayaking and floats along the river with naturalist guides. 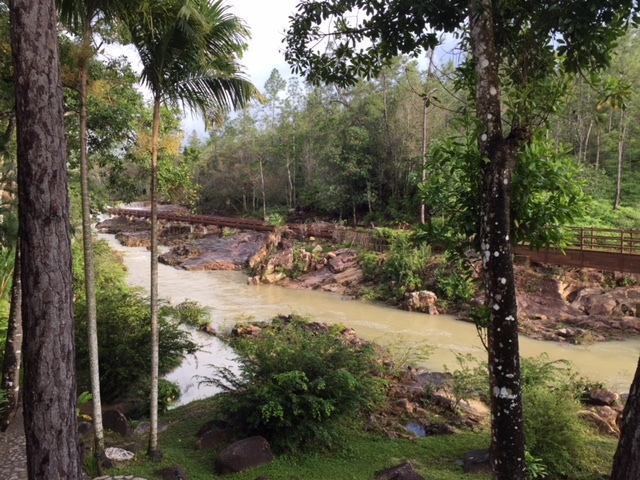 We saw iguanas, monkeys, three-toed sloths, river otters, crocodiles, toucans, parrots and other neotropical species. 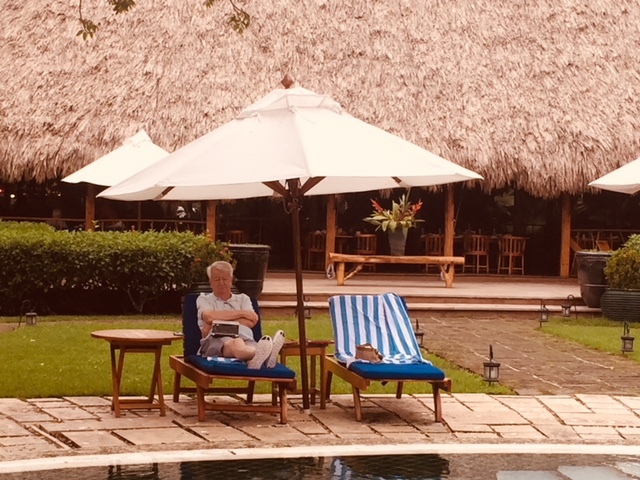 After four nights of somewhat roughing it there (and very early-morning wake-up calls by howler monkeys), we flew and then drove to the luxurious Four Seasons Resort, located on the northern Pacific Coast of Costa Rica on the Papagayo Peninsula in Guanacaste. Someone's got to do it! The resort is built between two golden sand beaches for great swimming there or in its four swimming pools. 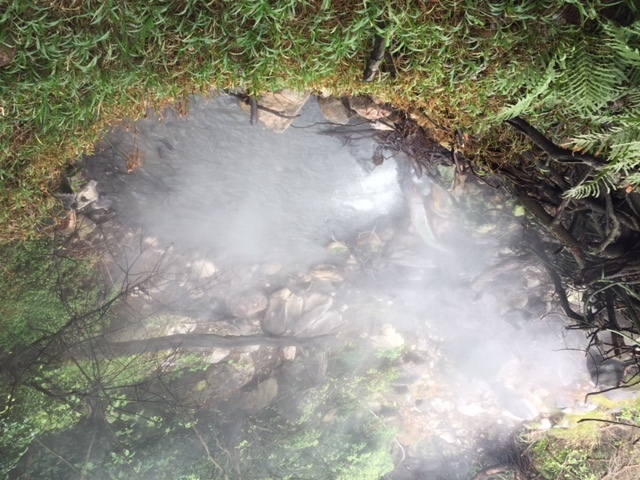 The highlight there for all of us was an hour and a half exursion to the Rincon Volcano in the Rincon de la Vieja National Park. We were actually on the bottom of the volcano--trips to the top are unlawful and dangerous--and got to hike along side bubbling volcanic activity and lush waterfalls. the second-- Blacaneaux Lodge--was located under a jungle canopy along a rushing river. 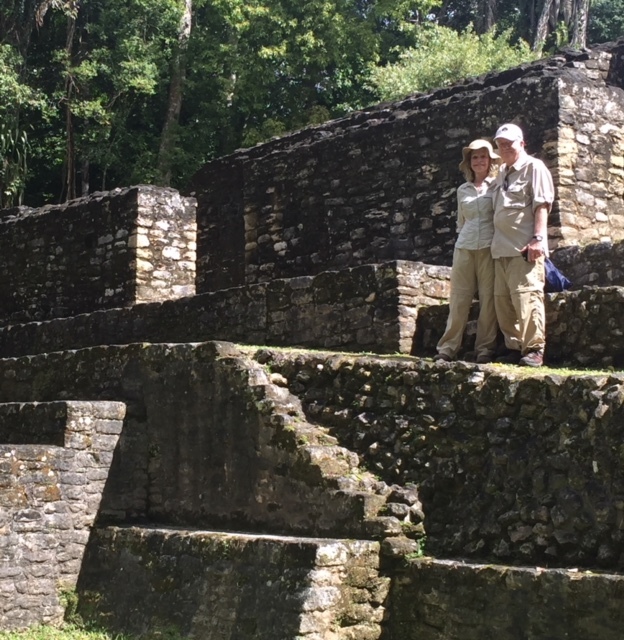 The highlight of our trip to Blacaneaux was an exursion to the Mayan ruins at Caracol. Situated high on the Vaca Plateau deep in the Chiquibul Forest Reserve, Caracol is the most extensive Mayan site in Belize, discovered in 1936. At the heart of the site lies the massive pyramid of Caana (Sky Palace), which is now almost fully restored and reaches a height of over 135 feet. 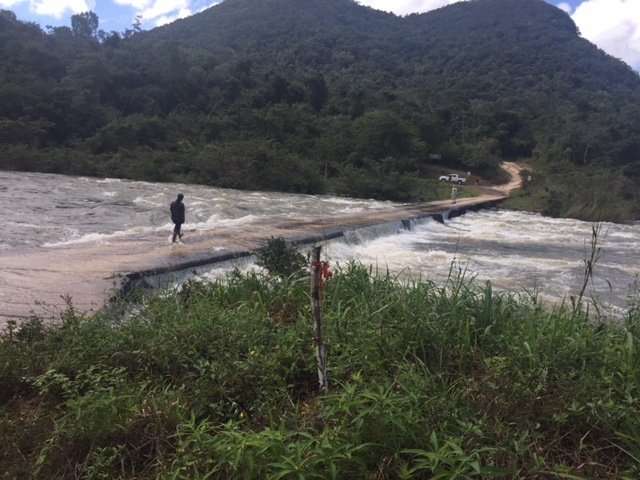 Another highlight of this exursion was actually getting there and back as the road leading into and out of Caracol was flooded. But we forged ahead without seat belts and with windows lowered in case we had to swim out of the car. A scary but exhilarating experience. We loved our trip to Costa Rica with our family and to Belize just with the two of us. We love the friendly people there and the opportunity to immerse ourselves in nature. We'll be back soon. 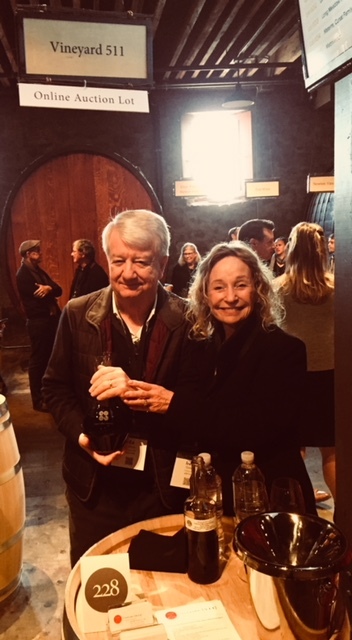 On February 24, Ed and I poured our 2015 Diamond Mountain District Cabernet Sauvignon at the 22nd annual Napa Valley Vintners Association (NVV) Premiere Napa Valley. 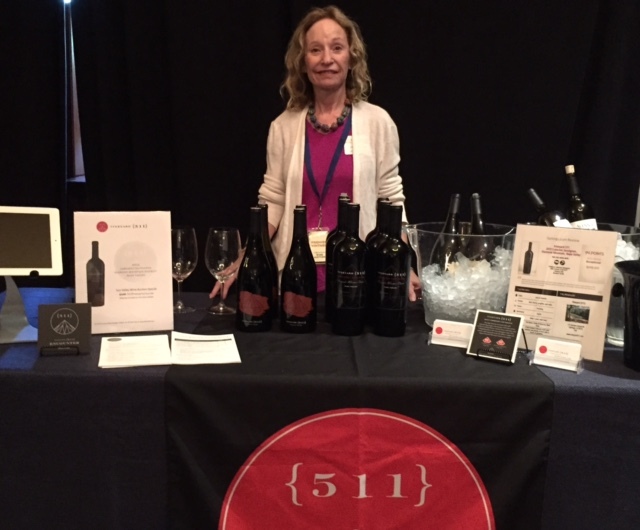 Premiere, a barrel tasting and futures auction of wine, was held again this year at the Culinary Institute of America (CIA). It raised more than $4.1 million to support the NVV's mission to promote, protect and enhance the Napa Valley. 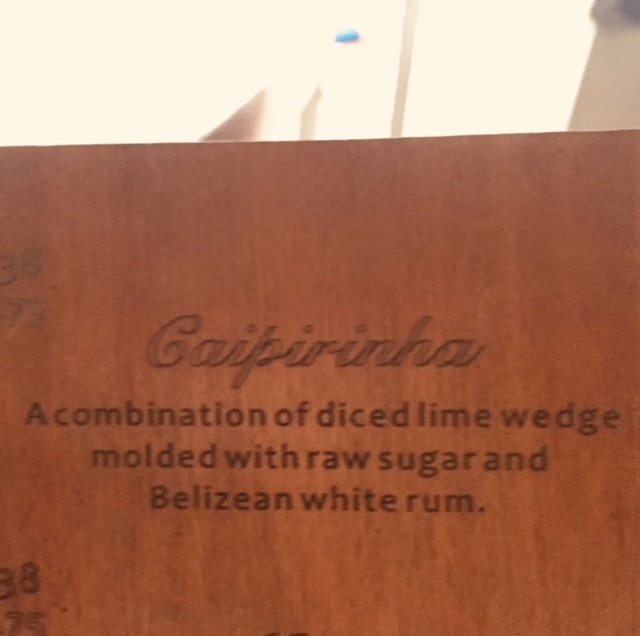 Premiere featured limited-edition lots, sold as futures to the trade--retailers, distributors, restauranteurs--of wine made only one time for the auction. Every bottle is hand-numbered and signed by the winemaker. We participated in the online auction with 30 other vintners. Our 5 cases raised $10,000. The top selling wine in the live auction went for 20 cases of Silver Oak Cabernet Sauvignon for a wopping $110,000 to retailer Total Wine--or $458 a bottle! 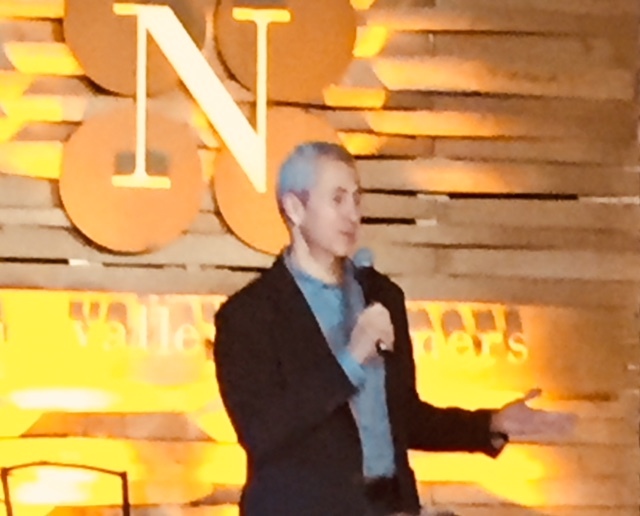 Earlier in the week at another Premiere activity at CIA--a luncheon--we listened to keynote speaker, famed restauranteur Danny Meyer. Meyer is the CEO of Union Square Hospitality Group and the founder of Shake Shake. His restaurants include wonderful New York City's Union Square Cafe, Gramercy Tavern and The Modern. He talked about the power of hospitality in restaurants, business, and life--about how you make people feel. Something important to remember. The seventh annual Napa Valley Film Festival (NVFF), which ran November 18-12, was an amazing week celebrating cinematic storytelling in all it's forms and celebrating the bounty of Napa Valley with incredible, film, food and wine in a beautiful setting. It was a wonderful way to showcase the area's resilience to bounce back from the wildfires that effected some parts Napa Valley. The festival donated 10% of proceeds to the victims of the wildfires. The week was hectic going from film to film, partying like crazy at dinner parties at Meadowood and Eleven Eleven and at receptions at the Caldwell Snyder Gallery, Italics Winegrowers, Acumen Wines, CIA at Copia and at the wrap party at Materra/Cunat Family Vineyards. The night before the official opening, Patrons of the NVFF were invited to a screening of "Back to Burgundy," about a heartwarming French winemaking family. After the screening, we headed down the street to the Caldwell Gallery for a meet the artists reception. The next night, Ed and I chatted with actor David Arquette at a pre-opening night reception at Acumen Tasting Lounge. The opening night film at Napa's Uptown Theater was our favorite film (which we sponsored), "The Upside,'" starring Bryan Cranston, Kevin Hart and Nicole Kidman. The film about a parapralegic crumudgeon (Bryan Cranston) and his cheeky personal assistant (Kevin Hart) was hilarious and uplifting and also our favorite film of the festival. The next day, Ed participated in a panel in the Festival's Artist in Residence program at Meadoweed, giving advice to up and coming filmmakers. Meadowood has been a major sponsor of the Festival for the whole 7 years. Ed is on the board of Go Digital, a digital distribution company. I do want to give a shout out to "Laddie," a documentary about Alan Ladd Jr., produced by his daughter Amanda Ladd. All I thought I knew about Alan Ladd Jr., was that he was the son of romantic film star Alan Ladd. Little did Ed and I know how prolific a producer of blockbuster movies he was until he retired, such as "Star Wars,"and "Braveheart." That evening we watched as Access Hollywood's Natalie Morales hosted a celebrity tribute to legendary filmmaker Nancy Meyers ("Private Benjamin," "Something's Got To Give," "Parenthood," and "It's Complicated,") to name a few. Meyer talked about the current revelations of sexual assault in Hollywood and praised the women who had come forward "who were doing something amazing for all of us." Actors Michael Shannon and Michael Stuhlbarg ("Boardwalk Empire," "Fargo"), also received celebrity tributes. After the screening of "The Shape of Water," in which both Shannon and Stuhlbarg starred, we sat next to Stuhlbarg and his wife Mai at the dinner that followed. We attended a Caldwell Vineyard Maverik tribute for Will Ferrell with a 1-1sany conversation with writer Andrew Steele. Afterwards, we watched a screening of off-beat "Stranger Than Fiction," in which Ferrell plays an accountant of all things and in which he was happy not to play a crazy person. Later that evening, Ed and I sat across the table from Ferrell and his lovely wife Vivica Paulin. The festival concluded with a closing night screening of "Molly's Game," directed by Aaron Sorkin and starring Jessica, Chastain, Idris Elba and Kevin Costner, the game being Molly's (played by Chastain) high stakes poker scene. 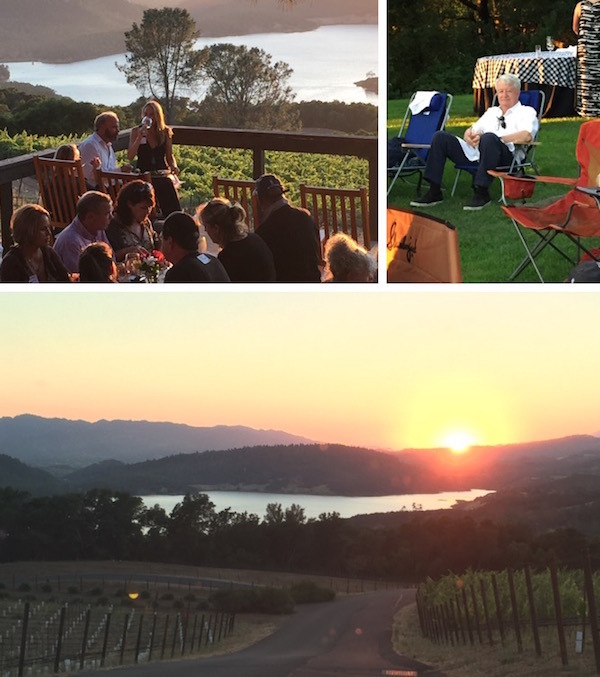 The wrap party followed at Materra Cunat Family Vineyards, with food, music and dancing and looks towards NVFF 2018. 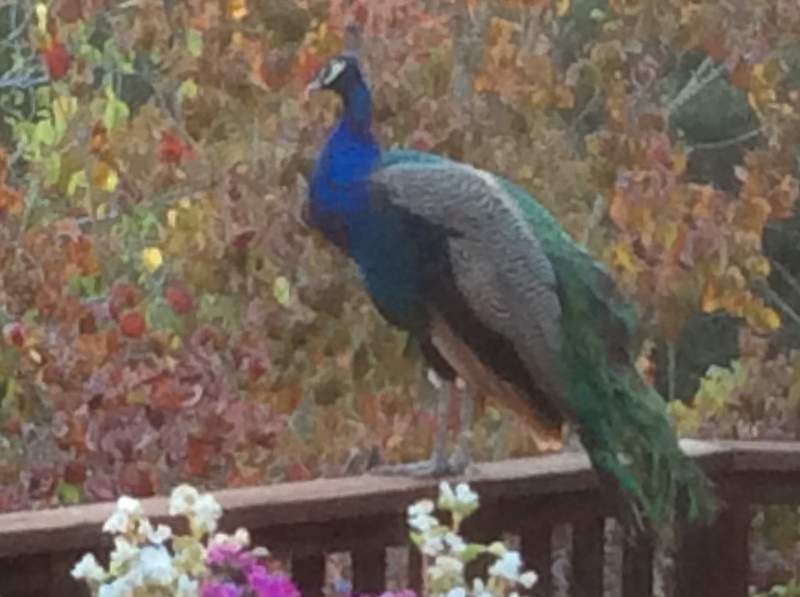 Our peacock Cabernet loves color since he is so colorful himself. Yesterday we caught him gazing at the beautiful autumn colors on Diamond Mountain, under blue skies and clear air. 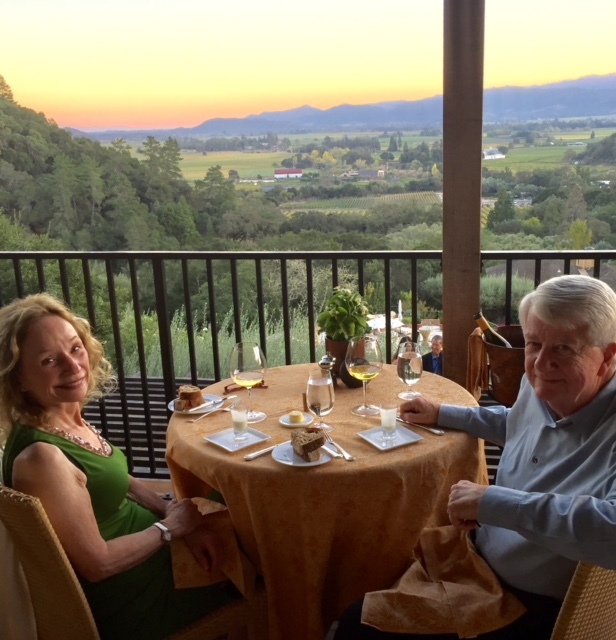 Later in the day, Cabernet's adopted mom and pop--Irene and Ed--checked out the beautiful Napa Valley--at Auberge du Soleil--where they celebrated Irene's birthday for dinner overlooking the Valley at sunset and more fall colors. We're so glad to be in Napa Valley, and are looking forward to sharing its beauty with many family and friends soon. When asked what the most memorable day of the year is, most people will say Christmas or New Year's or Thanksgiving. 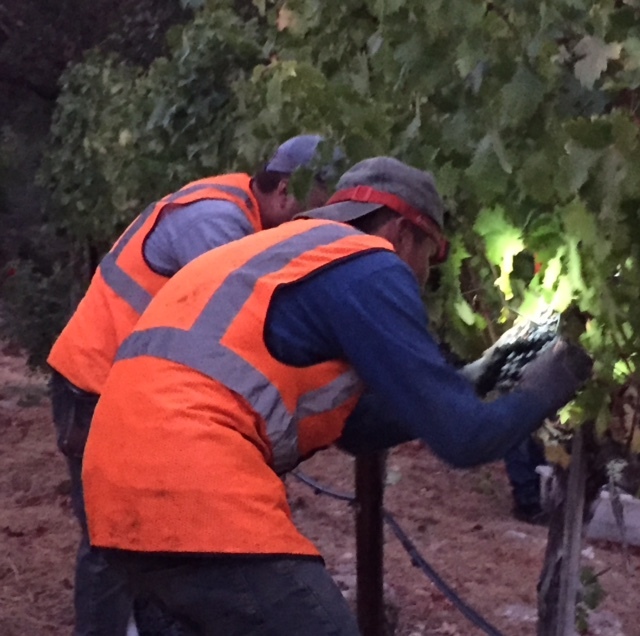 However, for folks in wine-growing regions of the world, harvest is right up there, if not the most memorable. 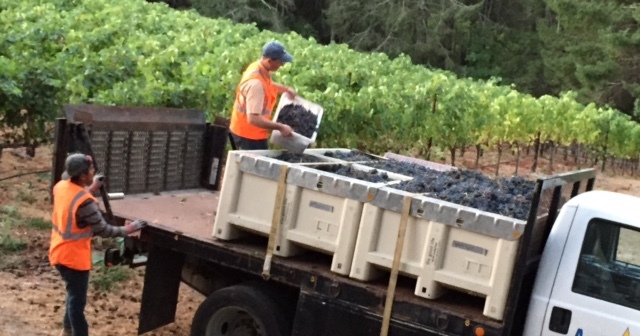 It's the time when nature and wine-making skills--yield and quality--converge to honor what growers have been working towards all year long--bringing the fruit to the crushpad. 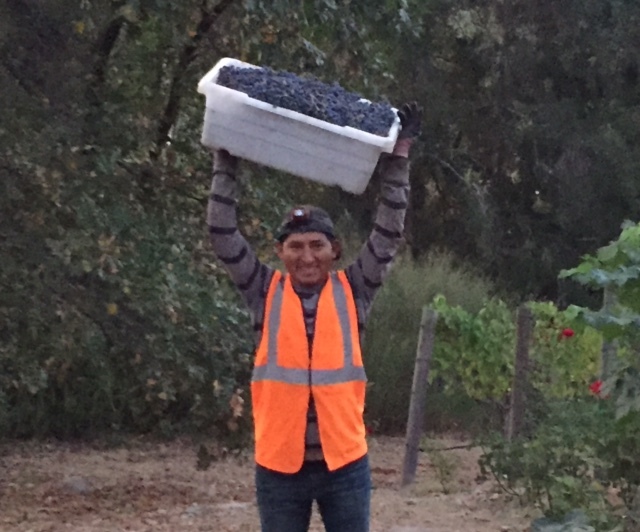 We were a little disappointed that our yield was smaller than it was in 2016 because of the heat spikes during the summer; nevertheless, the quality of the fruit was great--as usual. This year, Ed and I have been to the Hollywood Bowl three times. The favorites so far have been the wonderful Tony Bennett and Diana Krall playing many songs from the All American Songbook. The first half of each concert was performed by the Los Angeles Philharmonic Orchestra, conducted by now-world-renouned Venezualan Gustavo Dudamel, and by the Hollywood Bowl Orchestra, conducted by Thomas Wilkins. A highlight of these parts was Dudamel conducting Moon River. 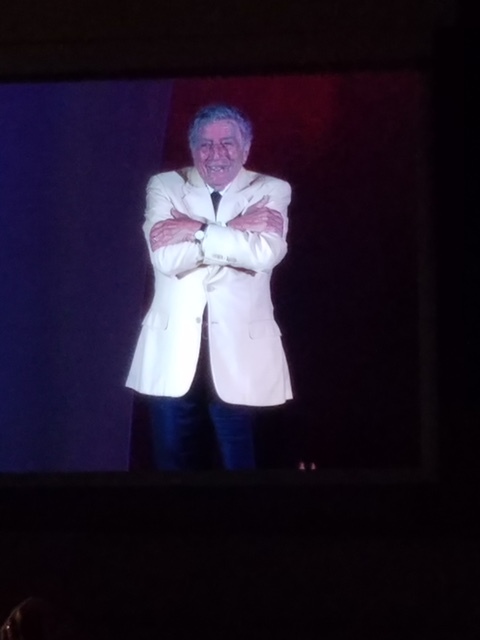 The first time we saw Bennett was at least twelve years ago at the Bowl, and he is still such a terrific performer, now at age ninety. The audience wouldn't let him off the stage until he sang--of course-- "I left my heart in San Francisco." He had a wonderful way to show his appreciation of the audience's appreciation of him, by giving it a hug by hugging himself. 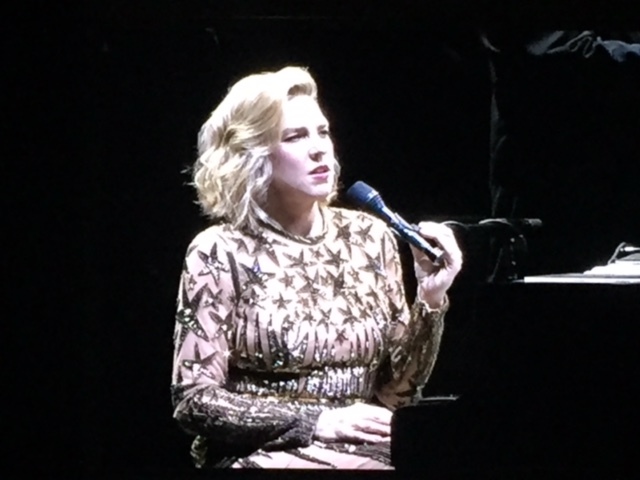 I think Ed and I have seen Diana Krall perform around five times, most of which have been at the Bowl, and she's never been better. As a jazz performer and having started her career at the piano and not as a singer, she had her back up band perform as much as she did. She treats her voice as another instrument. And--of course--she performed Cry Me a River, which always wows me. For the second year in a row, Ed and I participated in the Sun Valley Wine Auction in Idaho. 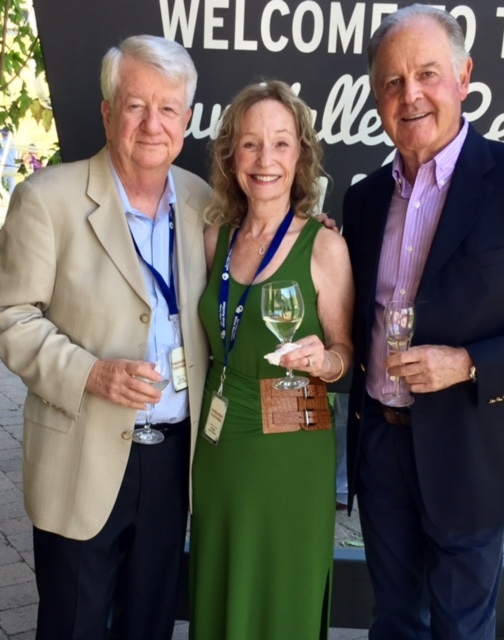 The three-day long program is an annual fundraising event for the Sun Valley Center for the Arts; proceeds from the Wine Auction make up 50% of the Center's budget and directly support programs in art education. We were hardly off our flight into Sun Valley, when we attended a delicious pig roast at Trail Creek Lodge. The roast is informally called the magnum party, as we all contributed great magnums to go along with the roast pig. We also poured wine for the trade and Auction attendees. However, the main event was the Auction itself, first with a reception on the grounds of the Dollar Mountain Lodge, where we chatted with Marquis Piero Antinori, the honorary president of Antinori Wines (whose amazing winery we visited in Tuscany). Next, the reception was followed by a delicious dinner inside an elegant tent while the Auction ensued. We were lucky enough to secure the winning bid for a wine-themed cruise beginning in October 2018, on the Sea Dream Yacht Club, starting out in Barcelona, and going on to the islands of Mallorca, Ibiza, Cartagena and Puerto Banus, and finishing in Gibralter and the port of Malaga, all along the way exploring the areas' vineyards and historic landmarks. We'll become experts on Spanish wine (and some culture too). We also secured a winning bid for a 3-liter bottle of 2014 Far Niente Cabernet Sauvignon and a tour and tasting of its winery here in Napa Valley. Can't wait for both experiences. This year, we brought along our family to Sun Valley-- kids Kelly and Jeff and their 4-year old son Ian. We took a wonderful gondola and ski lift up Mount Baldy, where we hiked around and had lunch. 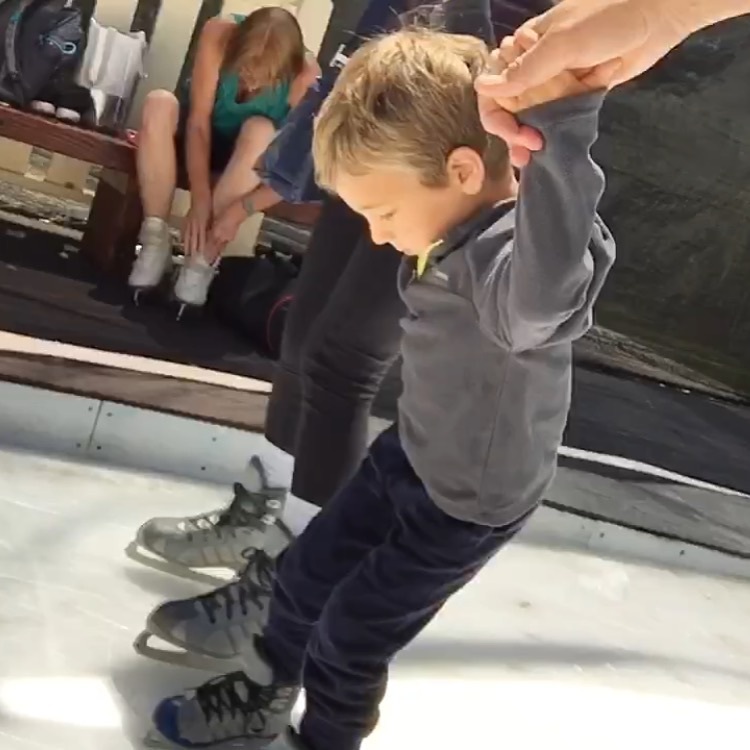 We also got to see grandson Ian ice skate for the first time at the Sun Valley Lodge's ice rink, home of the Olympic trials. Looking forward to The Sun Valley Wine Auction 2018! Ed and I attended a movie night for the screening of Walk the Line, the 2005 Johnny Cash biopic, which won an Academy Award for Best Actress, Reese Witherspoon, and a Golden Globe for Best Actor, Joaquin Phoenix. The outdoor evening on the beautiful Chappellet grounds on Pritchard Hill was donated by Michelle and Robin Baggett; Blakesley and Cyril Chappellet; and Elaine and Rick Jones. To attend the event, all guests had made a generous donation at last year's St. Helena Hospital Foundation Gala at Silver Oak Cellars to raise money to help bring continued innovation to health care in the Napa Valley. As we settled in on blankets and lawn chairs, we were being well fed with BBQ by grill chefs Robin Baggett and Cyril Chappellet. We all celebrated our inner cowboy while toasting to summer and the first new moon after the Solistice. The great wines were donated by Alpha Omega and Chappellet. Our favorite was a Chappellet Chardonnay. Last weekend, Ed and I took off for Mendocino, just a two-and-a-half-hour drive northwest of Calistoga. The drive there was beautiful, through the redwoods of Alexander Valley. The next day we returned to Alexander Valley for a day-long wine tasting exursion. Our driver took us to wineries of whose wines we'd heard, but never tasted. The first winery on our journey was Husch, which was also the most scenic. Then we stopped at Navarro and Roderer Estate (known for its sparkling wines, although we ended up buying its Chardonnay). Our favorite winery was Toulouse (yes, as in Lautrec). We really liked its Pinot Noirs and its shopping opportunities: I bought a sweatshirt hoodie with the cute Toulouse duck logo on it, and Ed bought some great silver wine pourers in the shape of different animals. 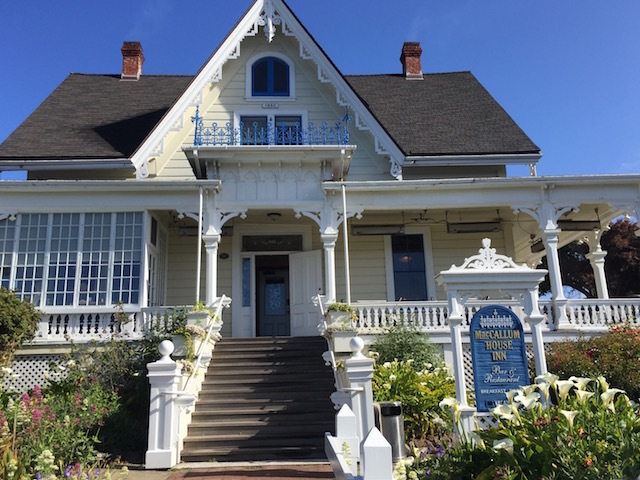 We returned to our hotel, the historic MacCallum House Inn (est. 1882), for a rest before heading to Little River for a terrific dinner at Wildfish. To burn off the great food and wine, the next day we took a marvelous hike through the redwoods along an estuary. Later, we checked out the town of Mendocino. One of the interesting features there was the water towers next to mostly every home, erected because the town never had a central water supply, only water wells. The water would be stored up in the top of the towers to create water pressure. There weren't many homes in Mendocino either, as the homes were all built out of wood; many of the original homes burned as there wasn't much water to put out the fires, and then (as now) only with a volunteer fire department. Another interesting feature was that, apart from the historic homes dating back to the late 1800s, the people there were a throwback to the 1960s. I expected to see Joan Baez and Bob Dylan strumming their songs there.